Childs+Sulzmann Architects | Bike sheds and boilers! We’ve seen this theory in practice recently with a planning application to install a biomass boiler in the grounds of a The Manor at Weston-on-the-Green, a 16th century listed country house hotel. Thanks to our 25 years’ experience in obtaining consents for heritage assets in sensitive locations, the application was successful, but it took 6 months to gain approval – longer than it took to achieve consent for a much more extensive scheme to add 30 rooms and a spa to a similarly historic venue! The boiler couldn’t go inside the house, nor close by because it would spoil the view, and so the application sited the boiler, inoffensively, behind a barn, tucked away behind some trees and shielded by green wooden cladding. This demonstrates to me a conflict that exists in our planning system. 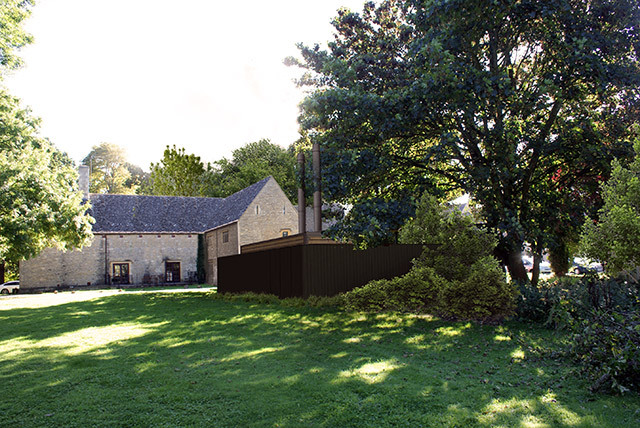 On the one hand there is a need for sustainable use of heritage properties, but when alternations are required to support a viable business, there are considerable planning challenges and a lack of flexibility which constrain even moderate developments such as our biomass boiler. The protection of our heritage assets through our ‘listing’ system serves us well generally, but I refer you to the bike shed! *C. Northcote Parkinson, 1957, provides the example of a fictional committee whose job was to approve the plans for a nuclear power plant spending the majority of its time on discussions about relatively minor but easy-to-grasp issues, such as what materials to use for the staff bike shed, while neglecting the proposed design of the plant itself, which is far more important and a far more difficult and complex task.